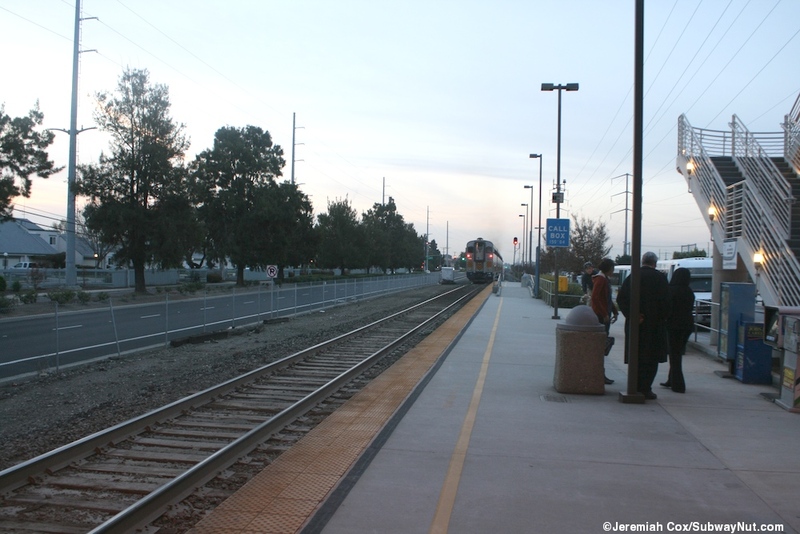 Santa Clara-Great America, CA is a train station shared by the Altamont Commuter Express (ACE) and Amtrak. 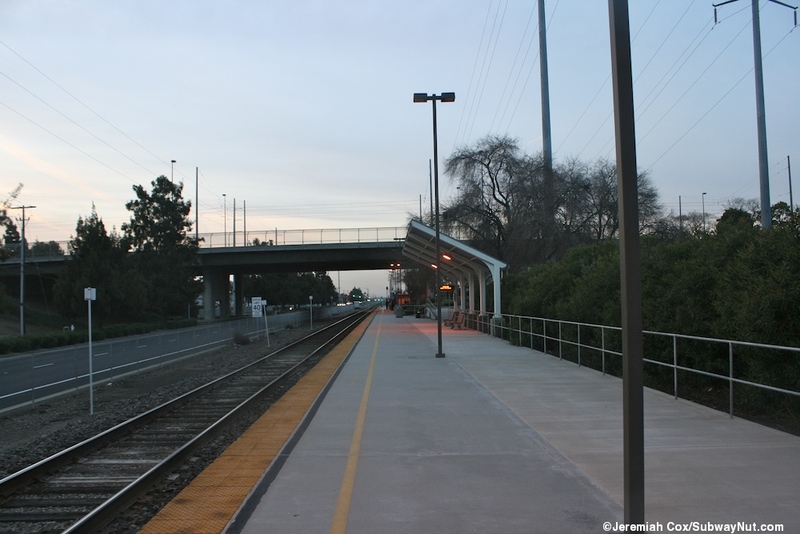 The station at first glace seems extremely simple with just a platform with a road parallel to it with a curb full of bus stops alongside the platform, beneath another overpass bridge. 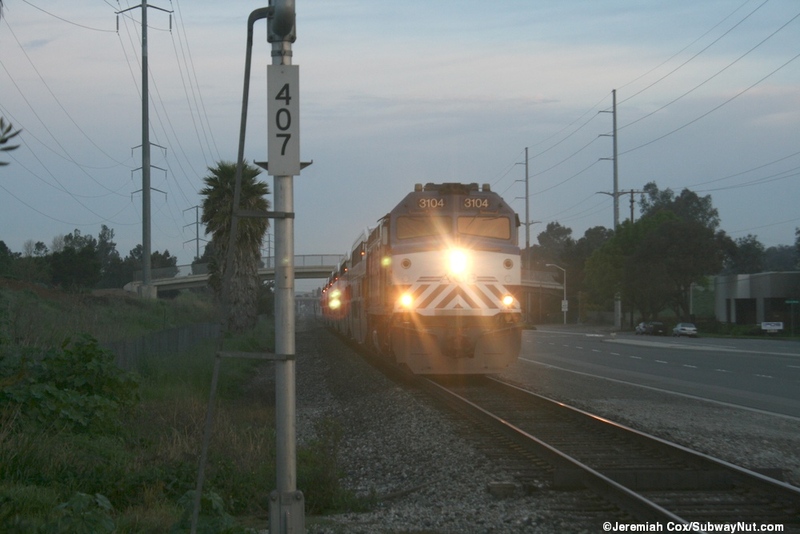 The bus stops here are one of the main factors that have made ACE Rail successful. From the bus bays, 8 different Shuttle Routes using minibuses connect with each of the 4 daily ACE round-trips to the many tech job location at corporate campuses in the surrounding area. There are also some private shuttles paid for by employers. The routes are named for colors and a listing of them shows how ACE has nearly run out of colors: Gray, Yellow, Red (the end of this route enters Lockheed Martin and is not open to the public), Green, Violet, Purple, Orange, and Brown. 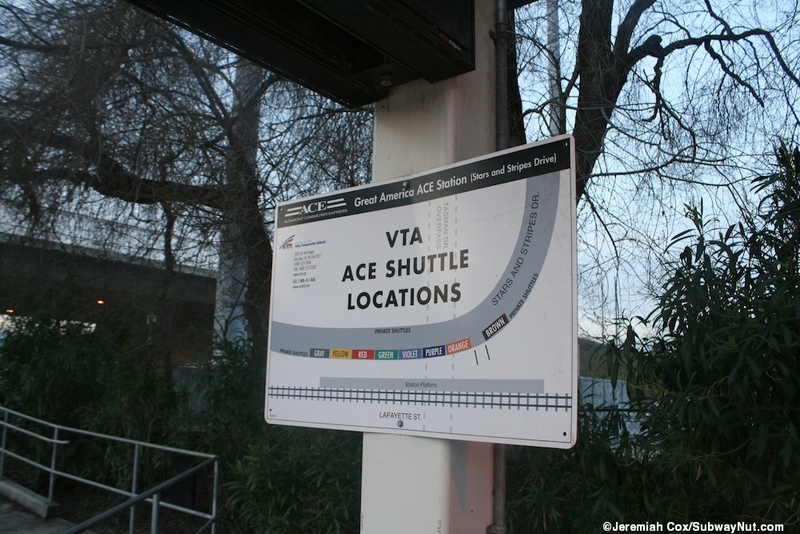 The ACE Shuttle Map lists the various corporations ACE serves and nearly every name in computer technology is on it. 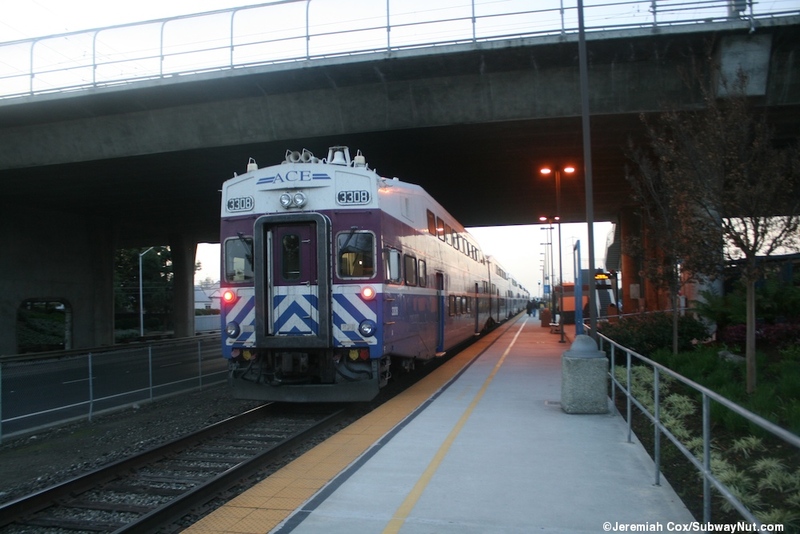 The station also has the VTA Light Rail stopping directly above it with the Lick Mill Station providing connections to service on the Mountain View to Winchester Line nearby. 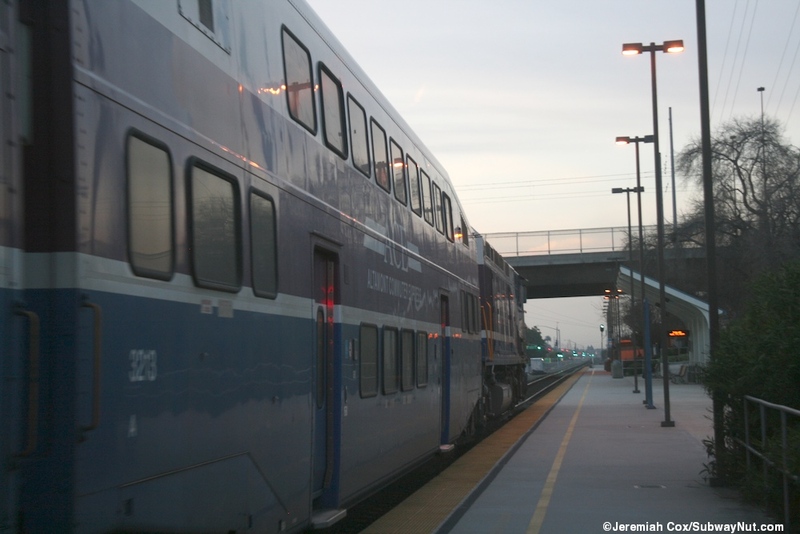 For history, the simple Santa Clara-Great America, CA was built and opened for what were then 3 daily Amtrak Capitols trains that began stopping on May 21, 1993. 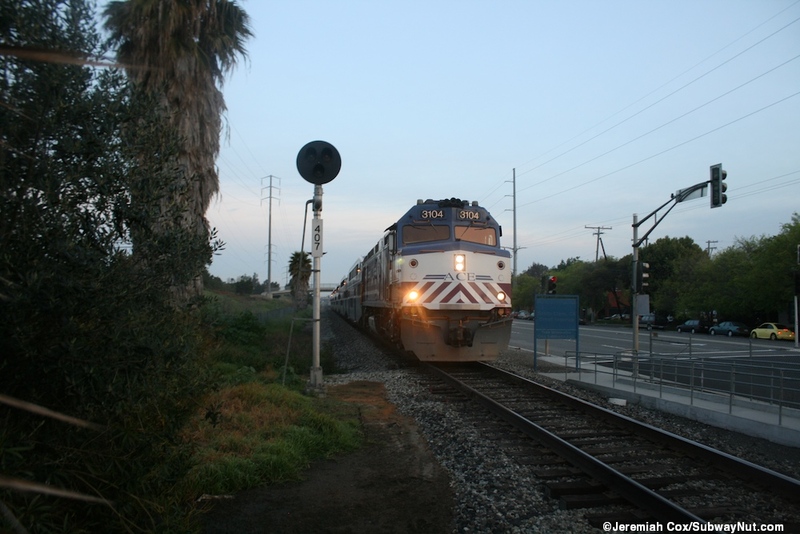 The Coast Starlight passes through the station but has never stopped, running non-stop from San Jose to Oakland. 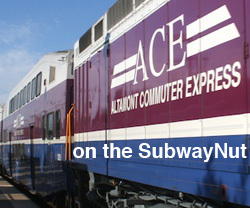 ACE train service began on October 19, 1998 and set up its extensive shuttle operations from the station. 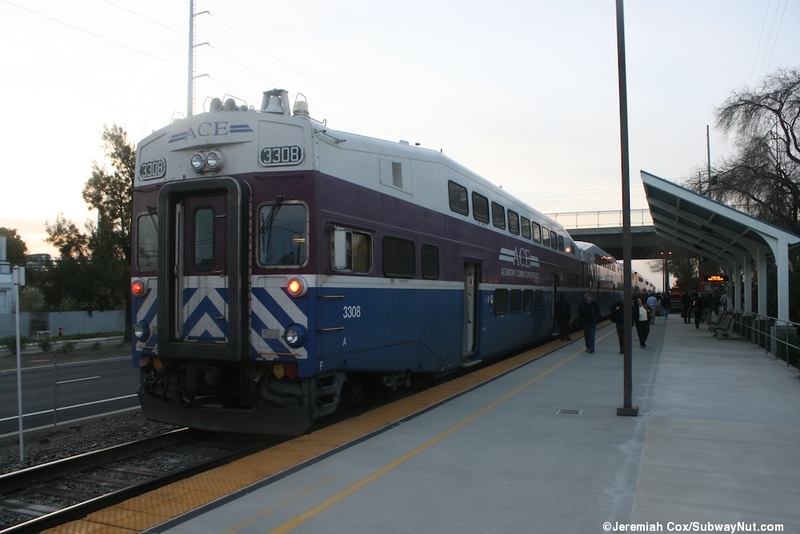 The station name is referred to differently by the two agencies and both train lines now also stop at Caltrain's historic Downtown Santa Clara (University) Station (since 2012). 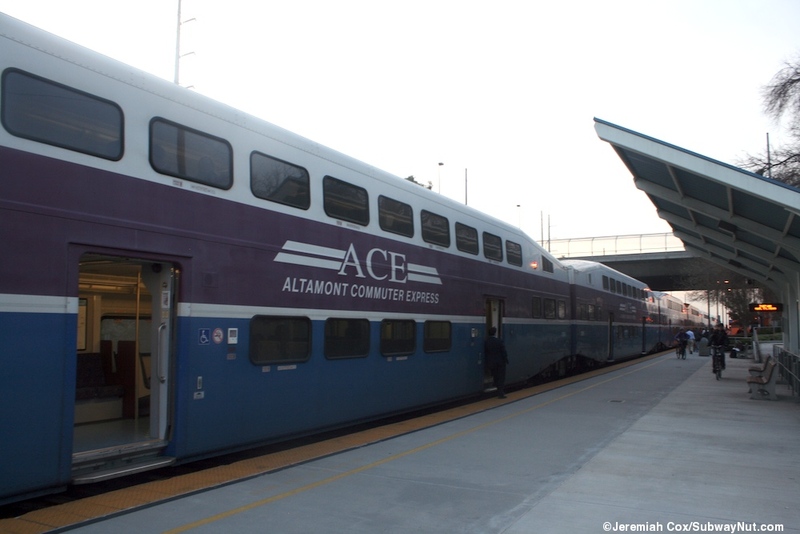 For ACE its simply Great America (since ACE is regional in nature), for Amtrak its always been Santa Clara-Great America, CA (since Amtrak is national). 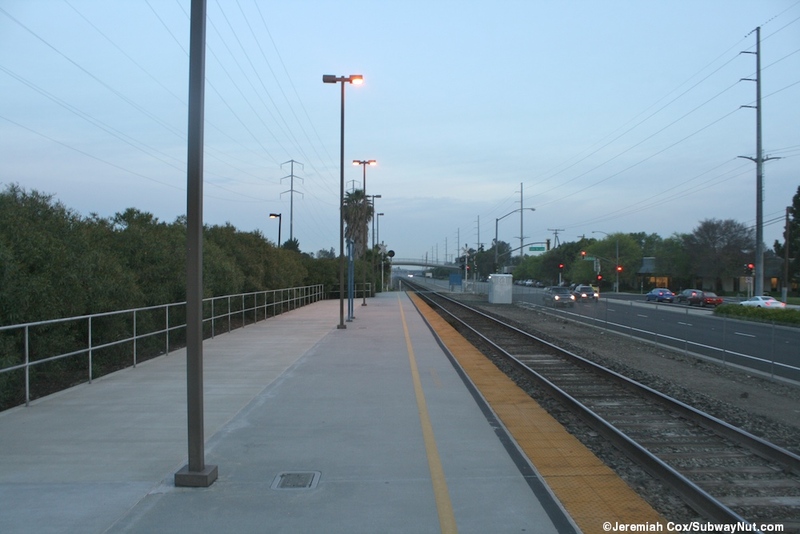 The station itself has a simple narrow side platform with for a single track. The opposite side of the platform is Stars and Stripes Drive and this is where all of the ACE Shuttle Buses Line up at for their connections. The road isn't completely parallel to the platform but a number of ramps lead from the platform up to Stars and Stripes Drive. There are also stretches of white fencing and plenty of greenery along the platform. Parallel to the track, opposite the platform is Lafayette Street and a pedestrian grade-crossing at the northern end of the platform is an exit to this street. 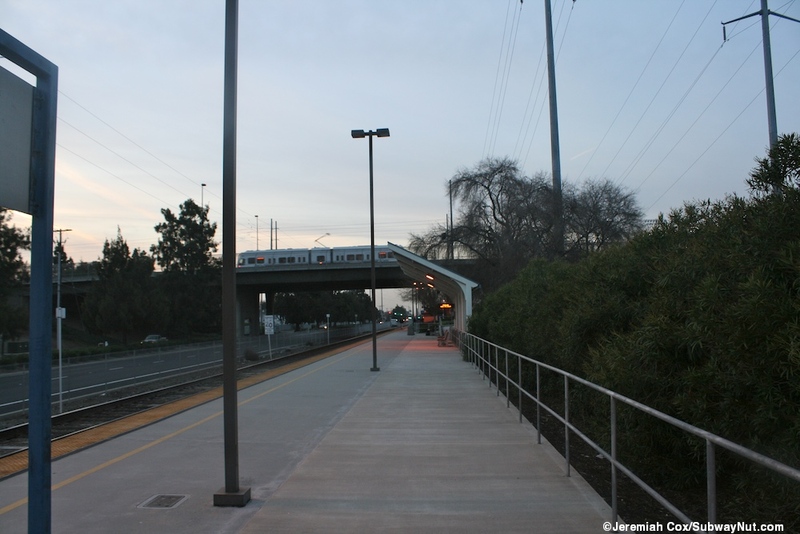 The bridge of Tasman Drive that has the VTA Light Rail running down the median of it crosses over the middle of the station and both of the two roadways that are at the same level of the station. 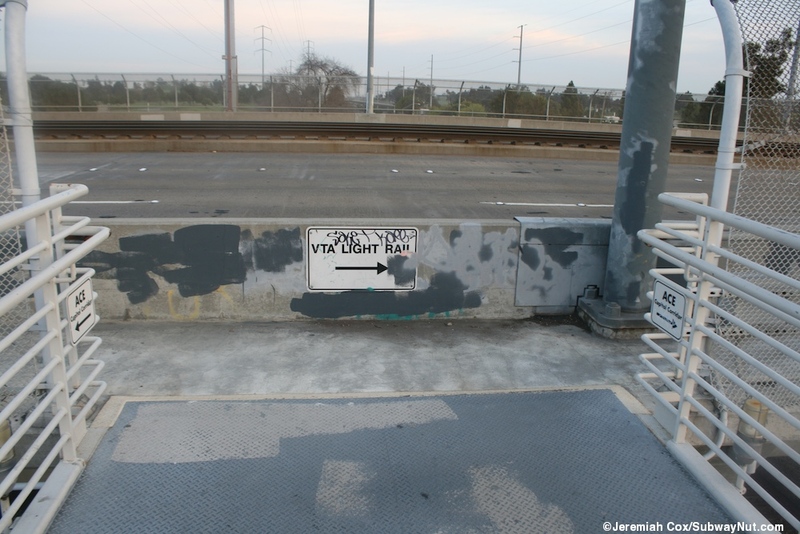 A staircase leads up from the platform to this overpass. 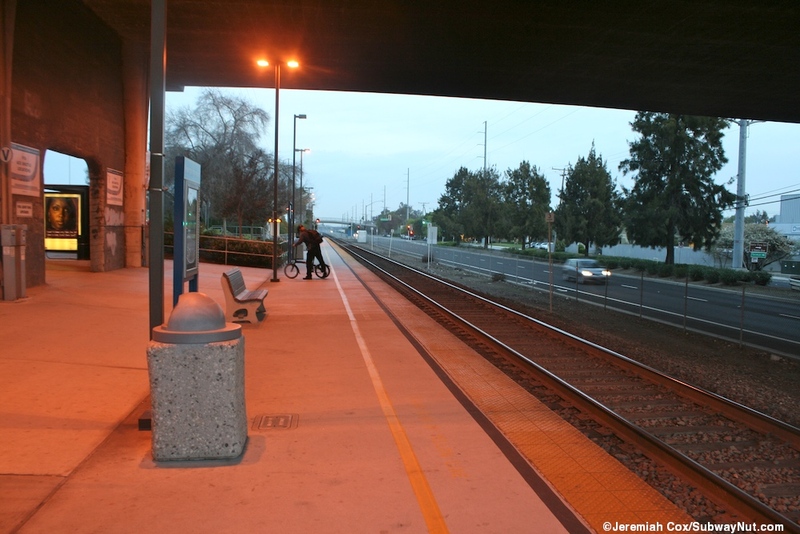 The only passenger amenities (the bridge provides decent coverage from the rain) is a simple highly angled canopy held up by white supports. 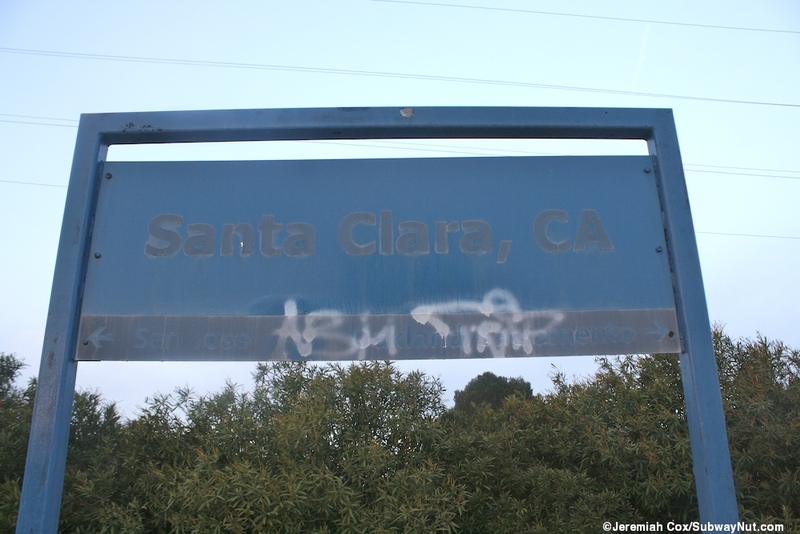 The platform is lined with blue faded signs that say Santa Clara, CA and the directions to San Jose and Oakland/Sacramento. There is also a ticket kiosk that sells ACE tickets before all PM Rush Hour Trains. 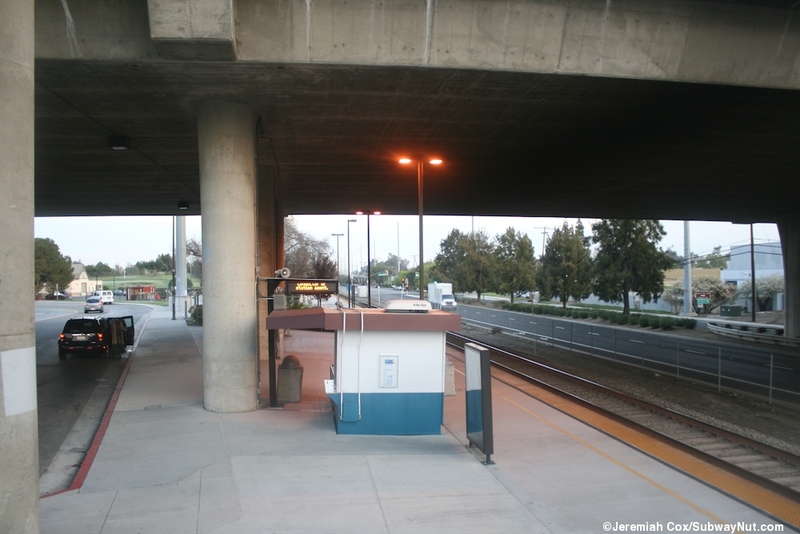 Next to this ticket kiosk are a couple of Quik-Trak Machines for Amtrak Capitol Corridor Passengers. At the southern end of Stars & Stripes drive is a 200 space park & ride lot where passengers can park for free for up to 72 hours. 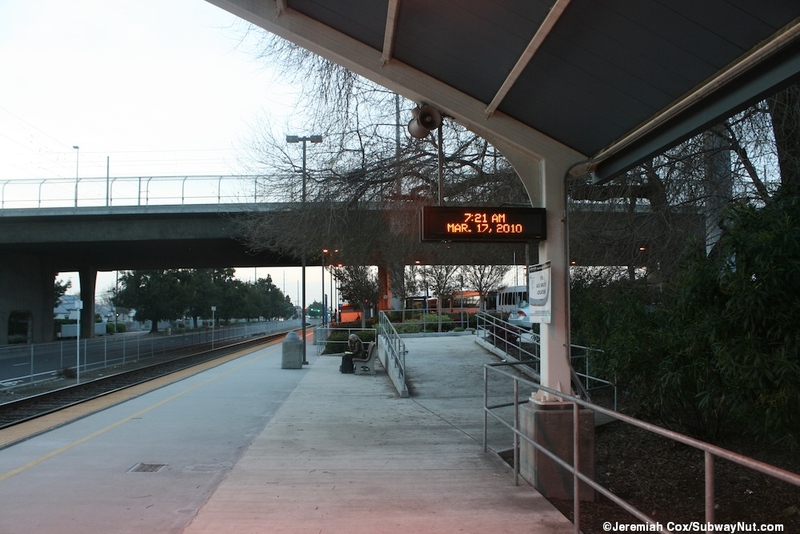 2014 Update: The station recieved some of the new black with white text 'transit center' signage that has been popping up all over the Bay area. 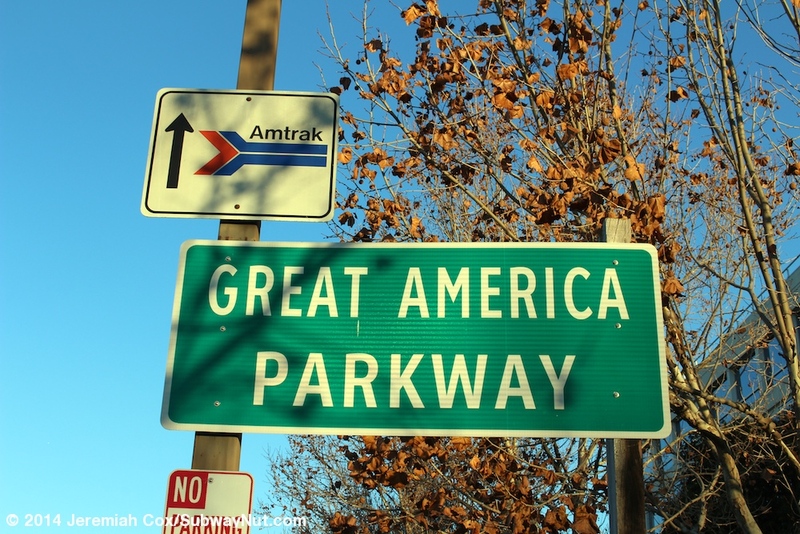 A large black entrance sign by the main driving entrance says: Transit Center: Great America Station (and the address) with the ACE and regular Amtrak logo. 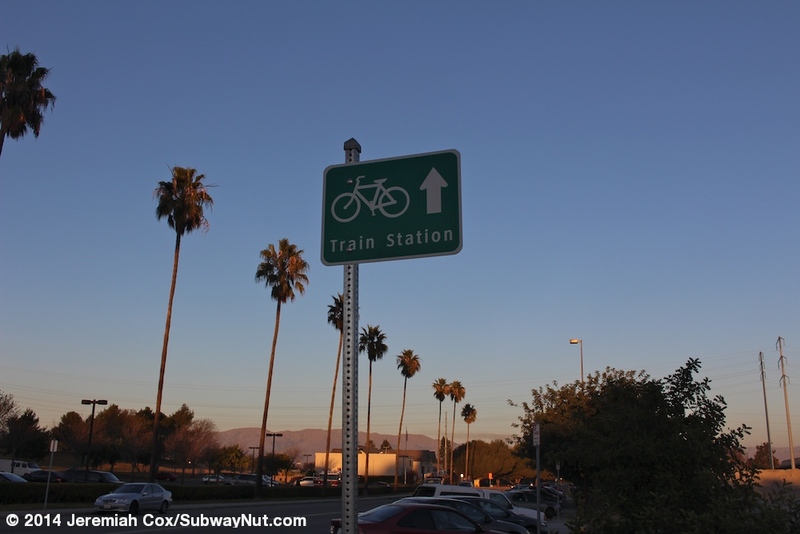 A pillar sign is at the pedestrian entrance across the single track from the station. 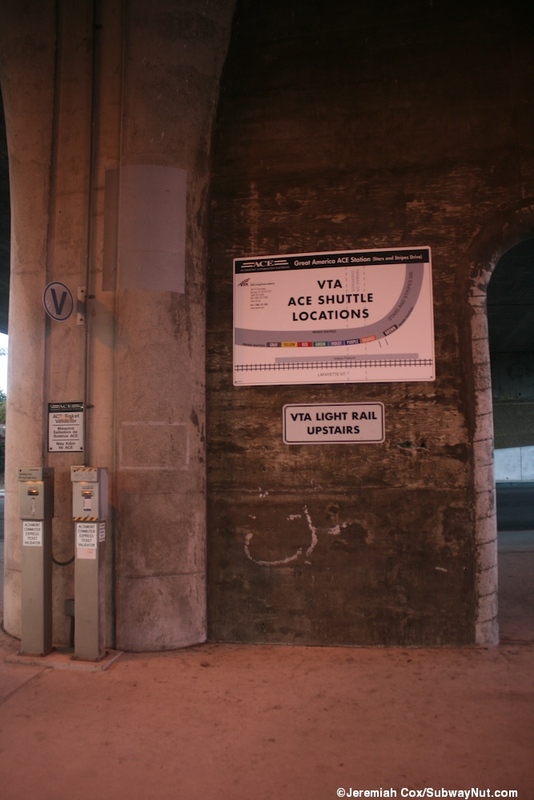 There is also a new map for 'transit information' and some new black directional signs driectly passengers up the staircase to the overpass bridge for the VTA Light Rail. 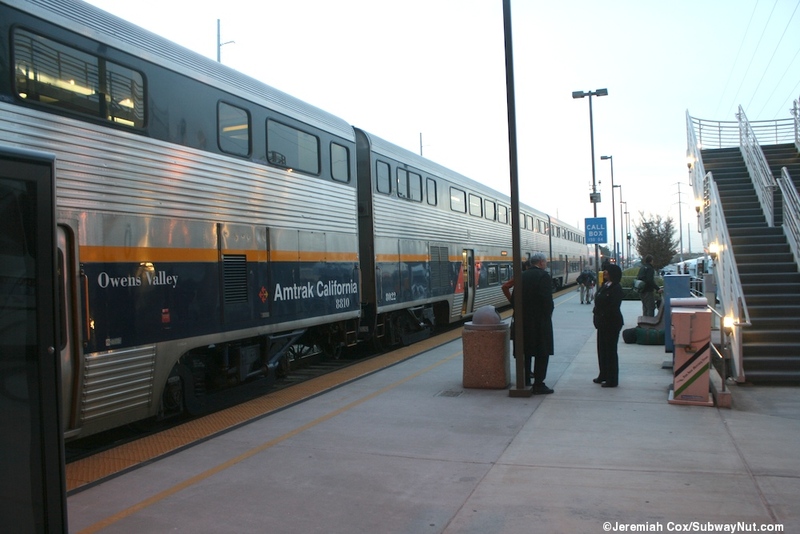 There aren't any new signs for passing rail passengers and when a Capitol Corridor train stopped in the station a passenger asked me the name of the stop.